Cutest Oil on panel, 8" x 10," $410. Ha! I love your sense of humor!! 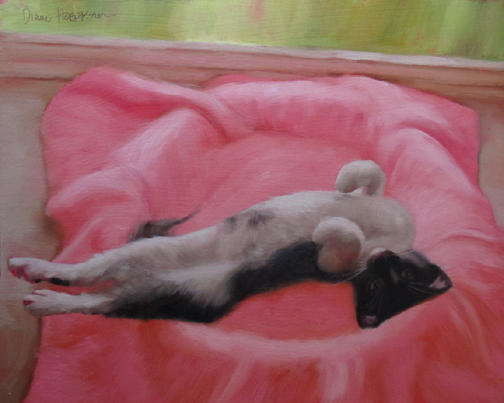 I am glad you bent your rule because this kitty is SOOO adorable...and I love the painting!!! However you do it, you paint your subjects in such a way that I don't even think them as cliche. Your art is absolutely wonderful!! kitten centerfold! Love it. Sometimes you gotta break the rules......The kitty's 'tude is " I don't care about no rules"
Cats are your subject, and of course all cats are vute, but your artwork elevates them beyond that! Love this pose. Reminds me of one of mine, my littlest one, who, though no longer a kitten, is very playful and sweet.